To meet the spurt in demand for Central assistance for various urban schemes, the government is considering to set up a special pool of funds that will hasten implementation of projects across states and cities. This fund will be created primarily through raising money from the market. The funds from this pool will be released in a staggered manner over the next three to five years that will enable early completion of projects ranging from affordable housing to smart city development. “To overcome the severe infrastructure deficit that got accumulated over long years, a huge order of investments is required. Central assistance committed under the new urban missions has increased manifold over what has been committed during the earlier 10 years. To meet various contingencies and to ensure fund availability to meet the targets under the new urban missions, we are thinking of mobilizing resources from the market. 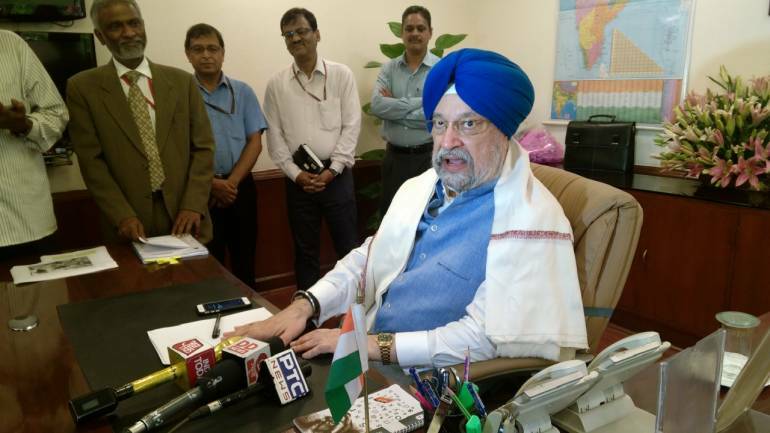 We have undertaken an assessment of fund requirements till 2022 and the likely availability of funds,” said Hardeep Singh Puri, in his first address after taking over as housing and urban affairs minister. He was speaking at the inaugural session of the 2017 India Public Affairs Forum. “To ensure assured fund flow, setting up of a special purpose vehicle to tap the market is under examination. Once the idea is firmed up, we will take it forward in an appropriate manner,” he said. The Central government is committed to extend Central assistance of Rs 50,000 crore under the Atal Mission and Rs 48,000 crore under the Smart City Mission until 2019-2020 and in the range of Rs 1 lakh to over Rs 2.5 lakh per each affordable house to be built until 2022. Even with the conservative projection of requiring to build over over one crore houses by 2022 under Pradhan Mantri Awas Yojana (Urban), internal assessment is that Central assistance to the tune of about Rs 1.80 lakh crore will be required to be provided, Puri noted, adding Central assistance released so far is about Rs 11,000 crore under the housing mission and about Rs 10,000 crore each under the Smart City Mission and Atal Mission. “The new missions, as part of the vision of our prime minister for a new urban India, are bold, audacious in scope and taken together will be truly transformative. The architecture and operational guidelines of these new initiatives for the urban sector will involve a paradigm shift from the one adopted earlier,” he said. He said that Indian cities were moving towards adopting new urban planning tools like transit oriented development, value capture financing, land pooling, innovative financing of metro rail projects. Also, by 2050, the population of India will be 75 crore and more than 50 per cent people will be living in urban areas, he said. The minister that on the second day of his taking over the office, he referred to the garbage issue in the national capital during a discussion on Swachh Bharat Mission and emphasised to his team that something must be done. The result of which is a Rs 300 crore plan for better garbage collection, storage and processing in Delhi. “We have approved a Rs 300 crore plan for visible improvement in solid waste management in Delhi,” he said. Under the plan, North, South and East Municipal Corporations of Delhi will be assisted from the urban development fund of the ministry for procuring machines for collection, transport and storage of solid waste, procurement of decentralised treatment plans and special machines for the upkeep of drains and sewers. He also said that the three MCDs will spend Rs 100 crore under this plan. “All vehicles and mechanical equipment will be procured and commissioned by end of December this year. Accelerated composters and bio methanation plans procured under this plan will add a waste treatment capacity of 670 metric tonnes per day,” he said. Equipment and machines to be procured include battery mounted and automated litter pickers, compactors, underground bins, mechanical road sweepers, accelerated composters, bio methanation plants and super sucker recycler machines for drains and sewers will be deployed. “This should bring some relief in the national capital,” the minister said. The first batch of 20 smart cities was announced on January 28 in 2016. A total of 90 cities have since been announced for financing implementation of smart city plans with a total investment of Rs 1.91 lakh crore. The last set of 30 smart cities was announced in June this year. The minister said that within a year-and-a-half of the announcement of the first batch of 20 smart cities, 2700 projects are at various stages of implementation involving an investment of about Rs 1.30 lakh crore. “This is a stupendous achievement made possible by the unprecedented enthusiasm and resilience demonstrated by city and state governments to make a difference. I would like to assure you that tangible gains on the ground will be seen in the next few months,” he said. As many as 1.39 crore urban households will be provided with water connections, sewerage networks will be improved from the present 30 per cent to 60 per cent, besides developing 1,900 open spaces and green parks. He noted that under the Mission, projects worth over Rs 20,000 crore are already under implementation and tenders have been floated for another Rs 25,000 crore worth of projects. Puri said that about 37 lakh individual household toilets have already been built in less than three years since the launch of the Swachh Bharat Mission (Urban) in October 2014. As many as 1286 cities have declared themselves Open Defecation Free and claims of most of them have been certified through independent verification. He also said that Andhra Pradesh, Gujarat and Chandigarh have become ODF in respect of urban areas and that nine states will become soon. He said that over 26 lakh affordable houses have already been sanctioned in over two years since the launch of the mission in June 2015 and that within this period, over 1.76 lakh houses have been built under the scheme and another 11 lakh units are under construction. The minister said that so far 400 cities have completed the exercise of acquiring credit ratings and about 340 of them have got credit ratings so far. “This is a major shift in the attitudes of our cities which is quite positive,” he said. He noted that Pune has already mobilized Rs 200 crore through municipal bonds and a few more cities are set to follow.